The Twins’ Birth Story, Part One | "In good writing, WORDS BECOME ONE with things." Before I embark on my next birth experience, I am sharing Henry and Arden’s birth story, in two parts. As I’ve said before, their lives every day since that day have been infinitely more important and wonderful than their birthday, but their entry into this world is a powerful story, and one I’m happy to tell. It is a story of babies being born, so there are times it is graphic. If you just heard a loud rumble, it was the sound of every male reader closing his browser and shuddering. If you’re still reading, I think you’ll find it’s actually not gruesome in the least; it’s just childbirth, which isn’t pretty, but is certainly beautiful. At 4AM on Thursday, July 25th, 2013, we woke to call the hospital to confirm our induction reservation. They require this in case they’ve had an unexpected influx of women in labor overnight, squeezing out room for us. Luckily this was a slow night, so we could proceed. 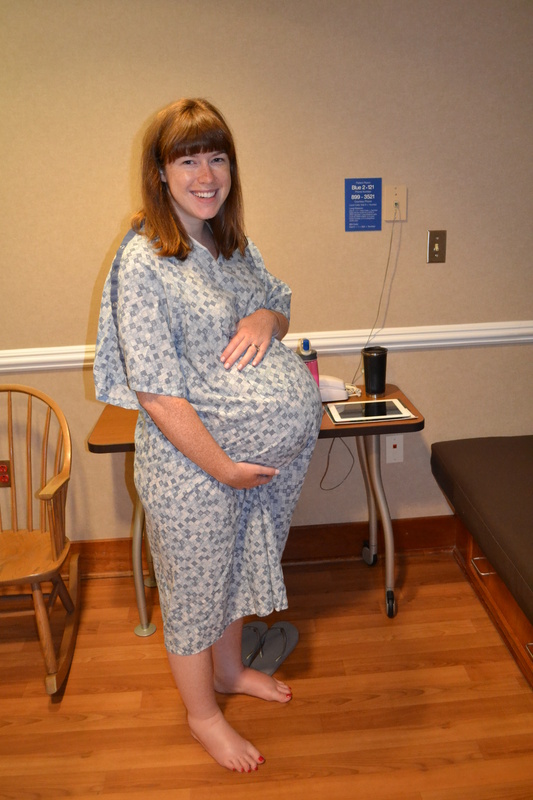 I had to be induced because of my doctor’s mandate that I not carry past 39 weeks — it can be risky to do so with twins. I was just shy of 39 weeks on my induction date. I took a shower while Mike slept a little longer, and then we gathered our things and got on our way. We were so excited, hardly able to believe this would be the day we’d finally meet our babies. We checked in and I felt total glee at each of us getting two bracelets, one for each baby. As they snapped the plastic around my wrist I knew for certain we wouldn’t be leaving the hospital without our babies in our arms, and that assurance wrapped like a blanket around my nerves. Our nurse was behind the counter, I’ll call her Megan, and the male receptionist introduced us to her, and said she was amazing. I looked at her warmly while I thought that we were about to share one of the most intimate experiences of my life and I would likely be very bonded to this woman in the next twelve hours. Around 7:15AM Dr Walker (I’ll call her) came in and proceeded to break my bag of waters, but only the waters around Arden. She said it was going to be really uncomfortable, but it wasn’t nearly as bad as I anticipated — a bit of pressure and then a pinch and it was over. The nurse commented that it was “one of the worst parts” and I was shocked and delighted to hear that. Almost immediately, warm fluid started flowing out of me and it was a surreal feeling, like peeing without being able to stop. This begs the obvious question — what do we do about this? When I had changed into my gown they’d given me enormous fake underwear. It was made of the softest mesh and was so stretchy I could have made a bodysuit out of it. The nurse gave me a pad to help absorb all the fluid, but I still had to hobble myself into the bathroom to let it out. This was the beginning of the end of my dignity. At first I was very smiley, declining the nurse’s offer of help as I walked to the bathroom saying, “No, no, I’m fine, I’ll just pop in here and take care of business.” But then Megan started the Pitocin drip (drug that initiates contractions during an induction) and my contractions started to become less “mildly uncomfortable” and more “this is increasingly painful and I can’t pretend it’s not.” Changing one’s underwear while nine months pregnant with twins is Olympic event enough — add contractions and it’s all but impossible. So when Megan suggested she help me in the bathroom, I meekly accepted through a grimace. I stood gripping the support bar while she yanked my underwear down to the floor and fitted me with a new pair in less time than it took for me to have a contraction. Even in that moment I was amazed at how quickly I had decided that getting help was far more urgent than preserving my modesty. 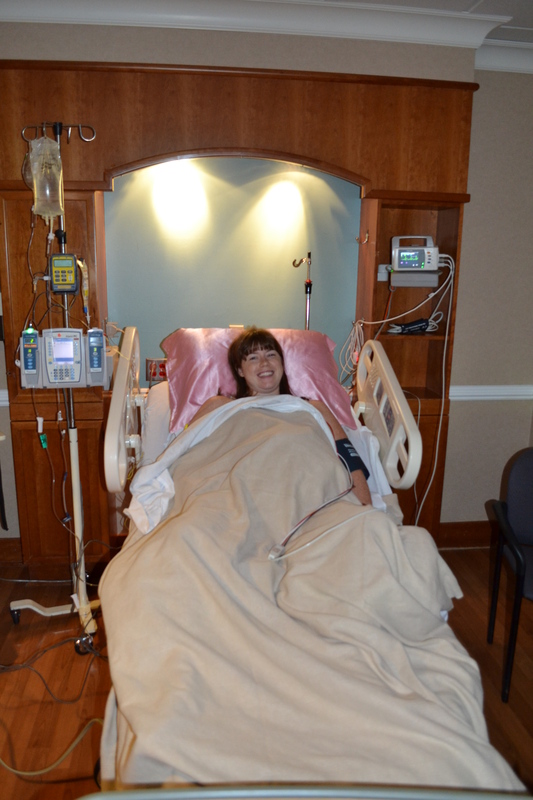 The contractions were slow to start, and I breathed through them and felt like I could absolutely handle them. Mike was supportive the whole time, but there wasn’t much he could do at that early stage. He fooled around on the iPad or tried to pass the time as I worked through each tightening feeling. The nurse said my “active” labor officially started at 9:15AM. They were coming regularly and I was having to be fully engaged. After awhile the nurse checked to see how dilated I was (yep, that’s still happening the old fashioned way — there’s no miracle x-ray that’s been invented, I’m sorry to report) and said I was either at 3 centimeters or 8. This was obviously disconcerting — how could she not know? She said if my cervix was angled it was a 3, but the chart didn’t say anything about me having that type of cervix. When I heard this, I became emotionally overwhelmed. She looked at me totally seriously and said, “Did you pray for a fast labor?” and I said “I think so, yes, I guess I did,” and she said, “All of your other prayers have been answered so I’m preparing myself for you to go quickly.” It was a powerful statement coming from someone who just met me, to take my relationship with the Lord so seriously. I started to cry a little bit because I felt unprepared for the labor to be that far along, and also a little scared, and also so excited and relieved I’d already done so much — if that’s all contractions were, labor was totally manageable! But then Dr Walker came in and checked me and said that I do have an angled cervix (or whatever the term was; I honestly don’t remember and didn’t write it down) and I was only at 3.5 cm. I was so disappointed and discouraged only to have progressed one centimeter. I buckled down to keep going. My friend Becca, who worked as a nurse at this hospital, had arrived earlier to support me — a hugely generous act given that it was her day off. She coached me and rubbed my feet, which felt awesome and also a little painful because they were so swollen. She was so kind and encouraging and four months pregnant herself, which made the gift of her time all the more incredible to me. Eventually there stopped being much of a break between contractions, and I said to the nurse, “I’m not getting any relief, they’re back-to-back! This can’t be how normal labor progresses!” She agreed with me and explained the difference between natural labor and induction — the Pitocin was at a high level and was causing contractions to come faster and faster. She suggested I get an epidural, but I said no because I needed to get further along, and besides, who gets one this early? She suggested I have the doctor check me again to see how dilated I was, and I agreed. When Dr Walker told me I was at a four, I nearly cried from frustration and disbelief. The nurse, unbelievably, turned to me and said, “The pain you’re feeling is 25% of the pain that’s coming,” and I could not even believe that pain like that existed. Dr Walker asked me why I wasn’t getting the epidural, and I said I thought she wanted me to go to about a seven before getting it. She suddenly got very serious and said, “No, no, no, I’m so sorry you thought that’s what I meant, but I just wanted you to go as far as you could. You’re there. When you can’t take the pain anymore, you get the epidural.” I asked if it would hinder my labor and she said no, and encouraged me to get it. I said “Okay, I cry uncle, yes, I want the epidural,” and as soon as I said it the nurse started paging the anesthesiologist. I felt immense relief at knowing help was on the way. I kept telling anyone who would listen that I couldn’t believe the pain; it was unthinkable that I was only at a four. I asked my mom and the nurse how on earth they did this naturally all the way. They reminded me they weren’t induced nor did they have twins; regardless, my level of respect for my mother skyrocketed because she gave birth to Erin and Sam without an epidural. With me she got one, which I now know obviously started our relationship on the right foot. I had several contractions before the anesthesiologist showed up and they were so mind-bendingly painful I thought I would pass out. I started expressing my fears – what if the epidural doesn’t work? How will I live through this? Please, I said aloud to Mike, my mom and the nurse, everyone pray that it works, pray out loud, right now! I was beyond desperate. When he showed up at 1:34PM I was overcome with happiness. He instructed me to sit on the side of the bed with my back curled and my head bent low. He said I must stay absolutely still, and I felt a contraction coming on so the nurse told me to put my hands in prayer position to steady myself, and then to stare at her open palm under my face as I hunched over. I dug as deep as I could inside myself to be able to stay still through unbearable pain, and then he announced he’d finished and I could sit up. I looked up and saw looks of pride on my mom and Mike’s faces that I’d done it. I wasn’t allowed to eat or drink after the epidural, so I kept asking for more ice to chew. Luckily, the hospital had pellet ice, which is my favorite ice on earth and the hospital is the only place that serves it besides Taco Time. It was heaven and I ate it constantly. I was so thirsty, just dying of thirst, and I kept sucking the ice to make it feel like water. They put a catheter in at 2PM because it would help drain my fluids while the epidural was working. I had been nervous about this but since the epidural was working I couldn’t feel anything. I slept, with about a thousand pillows stuffed all around me, from 2:45PM to 4:15PM. Bliss. The next time they checked me at 6:45PM I was at 7 cm, and I said, “Happy happy joy joy!” I couldn’t believe I’d made such progress with no pain. It was miraculous. At 8:50PM they checked me and I was at 8.5 cm — we were all in shock that the babies’ birthday was actually going to be July 26. Stephanie, our nurse at this point, instructed me to lie sideways to try to “drill” Arden down further into my birth canal. Stephanie was a friend of the Reph family, and at first I was a little apprehensive to have someone they knew as my nurse, but she was a God-send. She was kind, encouraging, warm, knowledgeable. She helped me turn onto my right side first, and she put a table beside the bed and put my leg on it because she wanted my left leg that far over. Getting into position was very difficult, but once I was there it wasn’t uncomfortable. There must have been eight pillows or more around me: one under my belly, several under my legs, a few around my head, and one on my back. After thirty minutes we’d switch to the other side, which always took at least five minutes. At about 10:30PM the nurse and doctor wanted to more accurately monitor Arden’s heartbeat, because she moved so much that the strap around my belly couldn’t accurately detect her heart rate (and we tried for an hour to monitor her externally to no avail) . I was upset about this because it would mean putting a tiny pin in her head, and I hated the thought. But Dr Walker assured me it wouldn’t hurt her at all (she had even put the pin in her own hand before to see what it felt like and it was very minor). So they put the monitor in the baby’s head, checked that I was 9 cm, and we could then see her heart rate. Henry was still monitored externally via the belly strap. At 11PM the doctor determined that I likely had an infection because I had a small fever of 101 degrees, and I would need antibiotics, as would the babies. This bummed me out, and would bum me out much more over the next several days when I had to have horrible intravenous fluid administered every five hours. Finally, at 1AM, like the announcement of a celebration, the nurse and doctor confirmed that I was at ten centimeters, and it was time to start pushing.